Restoring function, aesthetics following Mohs surgery. 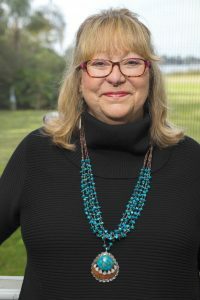 Blond-haired, blue-eyed and light-skinned, Pat Lawson is a child of the 70s who grew up just outside of Atlanta, Georgia, where she spent most of her weekends boating and water-skiing on nearby Lake Lanier. Throw in her family’s annual, two-week summer vacations to Panama City Beach and the fact sunscreen didn’t really become a thing until the 80s, and it’s easy to understand why Pat has spent the past 30 years battling skin cancer. “I have a family history of it that includes my brother dying from melanoma,” Pat relates. “Not only that, but most skin cancers are attributed to those early burns we experience as a child and teenager, and I had plenty of them. Mohs surgery involves the microscopic removal of thin layers of cancerous skin tissue that is immediately examined while the doctor and patient wait for the results. The procedure is repeated until the tissue removed no longer contains cancerous cells. Knowing it would be extensive, Pat was advised to make plans to begin reconstructive surgery the day after the Mohs procedure was completed. She made those arrangements with Daniel L. Rothbaum, MD, a board-certified otolaryngologist who specializes in facial plastic surgery at Atlantic Ear, Nose & Throat. The internal lining of Pat’s nose remained largely intact through the surgery, Dr. Rothbaum reports, but large parts of cartilage and a great deal of the outer layer of skin were missing. To rebuild the structure of the nose, Dr. Rothbaum harvested cartilage from Pat’s ear, shaped it, then sutured it to the remaining cartilage of the nose. In this way, he rebuilt the structural foundation of a properly functioning nose. Next, Dr. Rothbaum worked to replace the missing skin on Pat’s nose. That objective was achieved by a combination of three flaps in which skin from the bridge of the nose, the right cheek and forehead were used to reconstruct various subunits of the nose. Dr. Rothbaum is well known for his skillful reconstructions. For this reason, Pat’s dermatologist recommended Dr. Rothbaum for the job. “It takes a highly skilled physician such as Dr. Rothbaum to do this surgery well because I’ve seen others come out with results that are not as pleasing as Dr. Rothbaum’s,” Pat states. “He’s really good at it. He’s also very compassionate and optimistic, and I couldn’t be more pleased with his work.